Disney, widescreen 2.35:1, languages: English DD 5.1 [CC], French Digital Stereo, subtitles: none, single side-dual layer, 21 chapters, theatrical trailer, rated R, 126 min., $29.99, street date 11/16/99. Directed by John Turtletaub. Starring Anthony Hopkins, Cuba Gooding Jr., Donald Sutherland, Maura Tierney, George Dzundza, John Ashton. Theo Caulder (Cuba Gooding, Jr.) is an ambitious psychiatric resident who has been asked to evaluate the case of anthropologist and primatologist Ethan Powell (Academy Award winner Anthony Hopkins). A noted scientist, Powell vanished four years ago while studying the reclusive mountain gorillas in Rwanda. When a group of park rangers discovered Powell living among the gorillas, he turned on them, brutally murdering two of the rangers. Caulder becomes intrigued by the high-profile case. Sensing a career-making opportunity, and a possible book about the anthropologist, Caulder asks to be assigned to the case. Caulder begins his first sessions with Powell in the interrogation rooms of Harmony Bay, an oppressive, rundown maximum security prison in Florida's back country. Sedated and shackled, Powell has retreated into himself and won't speak to anyone. Increasingly frustrated by Powell's silence, Theo turns to Powell's estranged daughter, Lyn (Maura Tierney) for help. Slowly, Theo begins to make progress with Powell. Powell starts to share his memories of Rwanda and teaches Theo about the "takers" and "leavers" and a kind of revisionist history of mankind, how we went wrong and how we got to the place we are. As Caulder begins the task of trying to understand Powell, he becomes overwhelmed by his story and the tables turn so that instead of psychiatrist and prisoner, it becomes student and teacher. "Hannibal the Apeman" - that's what the previews for Instinct seemed to promise. We saw Anthony Hopkins tearing things up like a madman, and he sure didn't look too interested in rehabilitation. Based on that, I thought the film would present an action film that revolved around a rampage from Hopkins' character, Dr. Ethan Powell. Well, that ain't what we get. 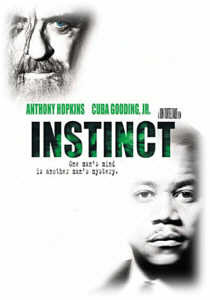 Instinct much more closely resembles The Shawshank Redemption than it does The Silence of the Lambs. Indeed, the film is really yet another in a long list of "hope shall be rewarded" movies like Shawshank. Hell, the thing even duplicates one of that film's signature shots, here showing an exultant Dr. Theo Caulder (Cuba Gooding, Jr.) in the rain. So if you take Shawshank, mix in a minor bit of Silence of the Lambs and add a dash of One Flew Over the Cuckoo's Nest, you end with Instinct. While the movie is far from original, that doesn't mean it's not decently compelling and watchable. Probably the best thing about the movie is Hopkins. I can think of only two actors in his age group that could have properly handled this role; Sean Connery would be the other, but even he probably wouldn't have been right for the part. Connery could handle the aggressive bits, but I don't know if he'd be good at the more sentimental aspects. As it stands, Hopkins offers the full range of emotions and does so convincingly. Most older actors would look silly in such a physical role, but he pulls it off with scary efficiency. He also convinces us that Powell still maintains humanity and intellect. He won't win another Oscar, but Hopkins manages to overcome the limitations of the role. Decent but less successful is Gooding. He's also a fine actor, though he lacks the subtlety of Hopkins, which is too bad since his character requires a much more deft touch. Gooding often seems to wear his emotions too openly; he's not a showboat, and he does okay in the role, but he just doesn't seem to have learned how to play the quieter scenes yet. Still, Gooding generally is personable and convincing; he only looks a little weak in comparison with Hopkins. Other than the actors, there's not a lot to Instinct. I found it to be watchable and mildly stimulating, but its lack of originality hurts it. Ultimately, I liked it and enjoyed viewing it, but I didn't feel any emotions stronger than that. Instinct appears in its original theatrical aspect ratio of 2.35:1 on this single-sided, dual-layered DVD; the image has not been enhanced for 16X9 televisions. All in all, Instinct looks quite good. The picture seems razor-sharp from start to finish and shows no signs of moire effects or jagged edges. The print used appears pretty clean; I saw occasional speckles but no other flaws such as grain, scratches or marks. Colors look excellent, especially during the lush jungle scenes. Black levels also appear very strong, with nice shadow detail. Again, the African segments best demonstrate that aspect of the image; nighttime scenes seem very well-balanced and appropriately clear. vhas made a nice visual transition to DVD. Instinct provides a Dolby Digital 5.1 sound mix that works pretty well, though it's nothing special. The front soundstage dominates, with the rear only being used for musical backing and some occasional ambient noises such as chatter from inmates or chirping from birds. While this lacks ambition, it suits the film fairly well, and I didn't really miss the involvement of the surround speakers, especially since the forward image seemed very well-defined. Different aspects of the audio appeared neatly localized but lacked that "speaker-specific" quality that detracts from the realism. The audio quality sounded consistently very good. At times, some dialogue seemed a little thin, but it generally appeared clean, natural and intelligible. Effects were clear and crisp, and Danny Elfman's consistently good score sounded terrific; it displayed strong dynamic range and helped move along the film. Overall, Instinct offers a good sonic experience. Instinct on DVD provides just about nothing in the way of supplements. We get the film's (somewhat deceptive) trailer, and that's it. Boo! Instinct is a good but fairly mediocre film that has a good but unexceptional DVD. The disc offers strong image and sound but lacks substantial supplements. Instinct might make for a pleasant rental DVD but probably isn't worth a purchase. James Berardinelli's ReelViews--"Instinct is a perfect example of how solid directing and good acting can almost redeem a derivative story." Roger Ebert--"If there's anything worse than a movie hammered together out of pieces of bad screenplays, it's a movie made from the scraps of good ones." Mr. Showbiz Celebrities: Anthony Hopkins--An excellent source for profile and credits on Anthony Hopkins and Cuba Gooding, Jr.
Filmtracks--A full review of the original score soundtrack composed by Danny Elfman: "Instinct does not make for a memorable listening experience." Amazon.com--Available to purchase are the DVD at special discount, Ishmael by Daniel Quinn, and the original score soundtrack composed by Danny Elfman.